The web’s easiest online invoicing system. Getting your invoicing system and payments right can be the key to a healthy cashflow. 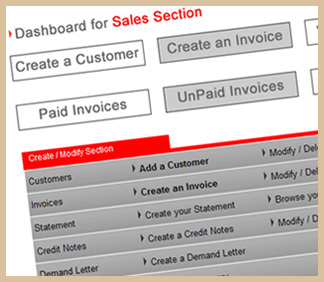 The iInvoicing system is an affordable and powerful invoice system which allows you to take full control of your Sales Invoices, at the click of a button. An extremely simply and user-friendly system for you to use. You will always know where you stand, who owes you and how much. It calculates VAT and organises and simplifies your bookkeeping so that your accountant or bookkeeper can get straight to work, also saving you time and money. Join the many people who are using iInvoicing to improve their business. Why is it so successful... because it takes away the headache and time issues from the business owner or staff members allowing them to have more time on the business. It is the easiest and most feature rich online system on the net and it is so easy to use with ALL the features you need to run a small to medium business. iInvoicing is a complete low cost system that has been developed and tested over the last 4 years by UK Website Solutions (we are both clients and fans of the system). “Having struggled for years with accounts like most small businesses, late one evening whilst doing the VAT, I thought that there must be an easier way after trying so many other systems and applications, they were either difficult to learn or unorganized so we developed this jargon-free, SIMPLE user friendly system designed for the small business not accountants but providing incredible results”. Jeff Nyman, Founder, Creator and 'Biggest Fan'. “Do I love invoicing now :)”. ...just register and start invoicing! “I bill faster, get paid faster, and have more time to concentrate on my business and I even actually enjoy invoicing clients now. Does this system suit you? It goes without saying this online system suits any freelance and small to medium size business that wants to save time and money. No envelopes or stamps to buy. No trips to the post office or mailbox. We know sometimes it takes businesses weeks to get around to actually creating and mailing their invoices. 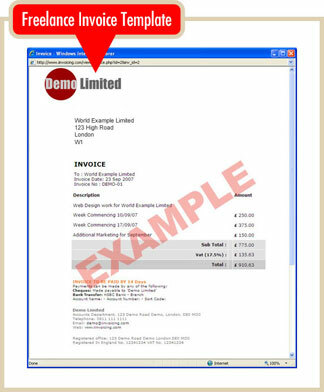 Now there will be no time wasted between when you want to invoice your clients and when you do invoice them. © Copyright 2004-2010. iinvoicing.com is a trading system of UK Website Solutions.